German rabbi and preacher; born at Wawern, a small village near Treves, Sept. 2, 1809; died at Amsterdam July 10, 1875. He lost his father, the village teacher and cantor, early in life, and, probably, would have lived and died a cattle-dealer had not a fall from a horse permanently unfitted him for any active physical occupation. Kahn went to Metz, where for four years he studied Talmud under Meïr Lagard; at Mannheim he continued his studies under Jacob Ettlinger; he then attended successively the universities of Heidelberg and Bonn. In 1841 he was appointed chief rabbi of Treves, where he officiated for more than thirty years. 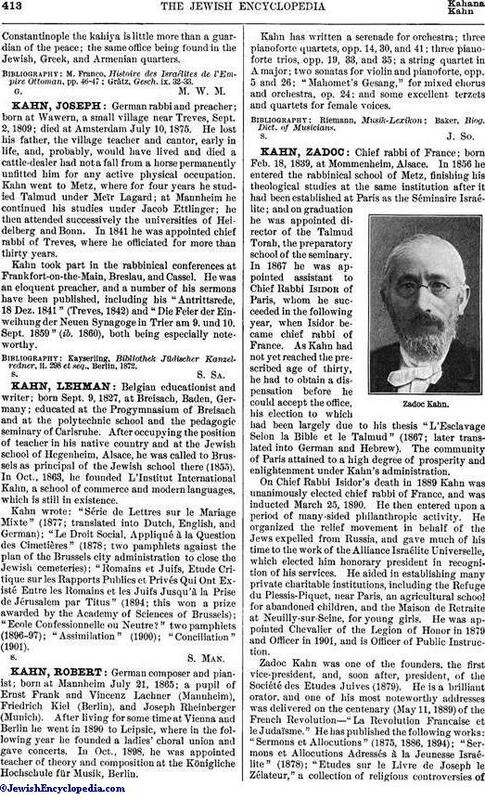 Kahn took part in the rabbinical conferences at Frankfort-on-the-Main, Breslau, and Cassel. He was an eloquent preacher, and a number of his sermons have been published, including his "Antrittsrede, 18 Dez. 1841" (Treves, 1842) and "Die Feier der Einweihung der Neuen Synagoge in Trier am 9. und 10. Sept. 1859" (ib. 1860), both being especially noteworthy. Kayserling, Bibliothek Jüdischer Kanzelredner, ii. 298 et seq., Berlin, 1872.